It’s easy to find a stage almost anywhere in this music-friendly city, the most iconic being The Moody Theater, home of the ACL Live tapings. There’s also Stubb’s known for its BBQ as much as the bands that have played there. Then there’s small to mid- sized venues all over town showcasing touring acts as well as Austin’s local talent, be it bluegrass, or a hard rock show. Whatever the case may be, you won’t be led astray. The ACL Moody Theater is a great venue to visit when you want to see some big name artists at an intimate spot. There is General Admission seating on the floor and balcony seating above. Every single vantage point in this venue offers a great perspective of the artist. Even those in the furthest seats will feel like they are up close and personal with the artist. In addition the lighting is intuitive and truly compliments the performances put on. To top off the trifecta, the room has unbelievable acoustics. The downtown location is ideal for those who want to grab a bite or hit up a bar before or after the show. For those that are running late though, the venue offers cold drinks at their bar and the occasional taco truck has been down to park outside. Stubb’s has been around since 1968, but its history traces back farther than that. Christopher B. Stubblefield, also known as Stubb was born and raised in Texas where he learned how to both appreciate and make good barbecue. Stubb left Texas in the 50s to serve in the last all black infantry during the Korean War. While abroad he fought honorably, and also honed his cooking craft by preparing large meals for the men. After the war, and after years of working for others, Stubb finally opened his own restaurant. The restaurant opened in 1968 and was located across from the county fair. Locals flocked to the restaurant in hugs numbers for the barbecue and blues music on the jukebox. Eventually word got ‘round about Stubbs and touring musicians began stopping by to check it out. Johnny Cash, Muddy Waters, Bob Dylan, Willie Nelson and Dolly Parton are just a few of the big musicians who stopped by to grub out and sing a tune or two. Since then, the original Lubbock location has closed, but its downtown counterpart has kept the dream alive. While most come for the food, many return for the live music. The location can be low-key or rowdy depending on the night, but it is always a good time. On Sundays they offer a killer gospel brunch for hungry church-goers who want to keep the party going. George Thorogood would certainly agree that this place is bad to the rib-bone! 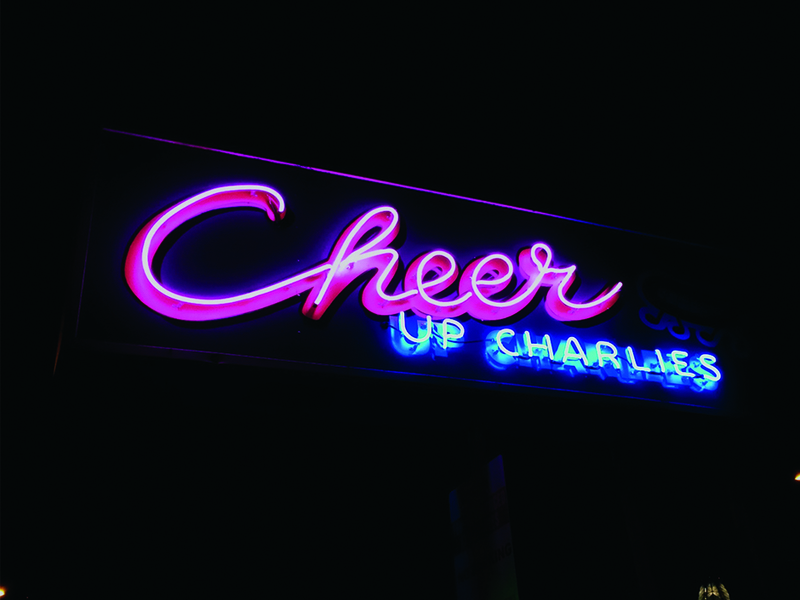 Cheer up Charlie’s is aptly named; it will definitely brighten just about anyone’s day. The dive-bar hosts Arlo’s Vegan Food Truck, which offers a wide selection for vegan visitors. Their bar is also vegan-friendly, with a variety of strong drinks that are quite creative. You can get a Vegan Yeti (vegan version of a White Russian), a Kale and Lime Margarita, Kombucha on tap, local beer, or a variety of other organic cocktails during happy hour. If you want to bring out your inner child grab a alcoholic popsicle and hit the dance floor which lies under a parachute shade. The outdoor stage hosts daily music events and the occasional movie or comedy night. The gay bar is often filled with people dancing, singing and grooving to the local acts who play all different types of music. You can also head inside for a more chill night. This is a great spot for afternoon brunch or a late night (open till 2). Israel Nash has been rounding up other Austin locals like Bee Caves to put on a special intimate show for fans during SXSW for the past couple of years. Each year, the show is a flying success and makes way for a bigger celebration the year after. With roughly ten artists performing, and plenty more special guests spontaneously stopping by, you really get your bang for your buck. There is no there way to get a closer look at an artist in their natural habitat. The surrounding hills provide beautiful acoustics and serve as a backdrop for the vibrant sunsets. If you want t escape the crowds and drown in the music, this is the place to go. There are dual performances from one to eight at Plum creek Sound Sessions and Hill Country Stage, aka Israel Nash’s backyard. You can take a shuttle or buy a parking pass to get to the remote and secretive location. Free beer is provided as well as select prices on tequila tastings and food from Belly Up. The hills are definitely still alive with the sound of music. These recs are from our latest vinyl and city guide package, The Sights and Sounds of Austin, presented by Boost Mobile. Check out the digital version of the guide below or head on over to our interactive Austin city guide! Video Premiere: Ume Delivers Mother-Daughter Love Song on "Crushed"
Video Premiere: Israel Nash Gathers the Sounds of His Home on "Lucky Ones"